You can't talk about guitar amps without mentioning Marshall. The iconic white on black Marshall amp is making its way into the home audio lifestyle. Marshall Headphones in partner with Marshall Amplification have announced of the Hanwell, the company's first home speaker designed after Marshall's iconic classic concert amps. The Hanwell will feature retro golden colored analog volume, bass and treble knob adjustments and switches with a pair of long-throw woofers and a set of dual hi-fi tweeters housed in a black vinyl wrapped wooden cabinet. 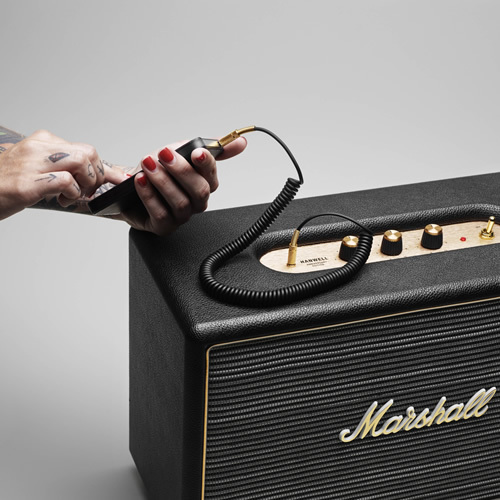 Marshall's Hanwell hi-fi speaker will include a coiled audio cable and will go on sale in November for an undisclosed amount.